I’ve begun billions of things in my life and hundreds in the past year alone. I’ve begun hobbies. Relationships. Jobs. Other blogs. I’ve started all sorts of things and allowed many to slowly fizzle out, though their remnants remain scattered all across my life. I think that’s our biggest misconception about beginnings. There’s this notion of each beginning as a fresh start. A clean slate. A new leaf. We like to believe that the old stuff gets left behind in the process of beginning anew. But that old stuff isn’t going anywhere. You don’t get to erase the bad stuff. But you do get to transform it. You get to make it your fuel. Change happens — life happens — in the intersection between old and new. Our pasts will always play a crucial role in our presents, because we have to crumble apart in order to progress. Our old messes make the mulch we need to get where we’re going, to grow where we’re growing. Nature’s most effective fertilizer is that muck of decomposed matter that we all fight to ignore. And that mess is magnificent. I think it’s time to stop ignoring it. 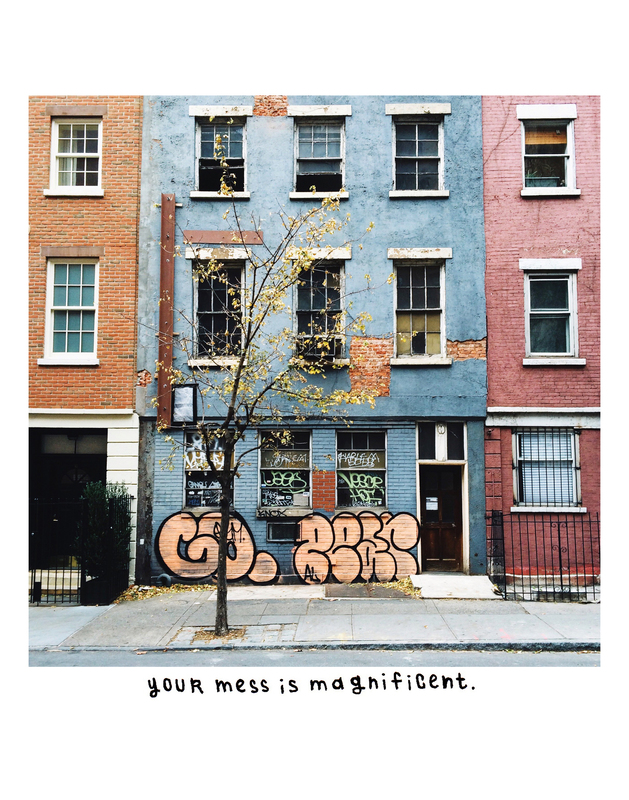 I think we should honor our shambles, the way the buildings of New York honor their crumbling bricks and graffiti. My favorite city structures are the ones with paint peeling off in curled strips like pencil shavings, the ones with fragmented storefront lettering and splintered shutters and tattered awnings, especially when sandwiched between shiny silver highrises. My favorite trees are the stragglers, the ones with branches scattered and leaves disheveled like bedheads, fighting to tilt towards the sun. They remind me that everything has a past and also a future. There’s no beauty quite like the raw-edged disorder of transition and growth. It’s the beauty of beginning, again and again and again. This blog itself is a beginning’s beginning. It’s a tiny seed of something bigger I’m sowing. It might collapse. It might freeze when it touches the air. It might hit the ground. But I’m beginning it anyway. And whatever you’re beginning — a new career, a new attitude, a new friendship, a new book — let’s begin together. Let’s soak in this sunshine and this rain side by side. Let’s share this recycled start. We’ll both be bolder for it. If there’s nothing you’re starting, pick something. Pick the thing you feel brewing deep inside, the thing that’s biological, the thing that’s stronger than fear, the thing that says, GO. YES. GO.